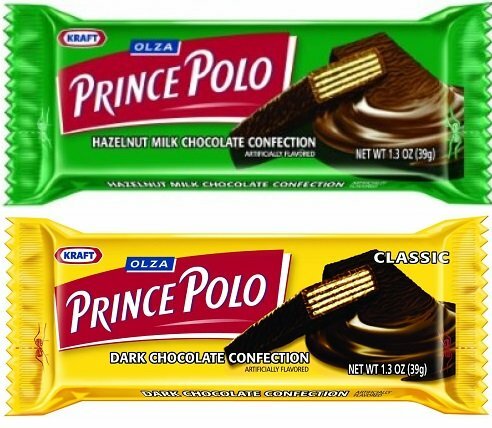 Assorted Olza Prince Polo pack: 5 Bars of Classic Dark Chocolate and 5 Bars of Hazelnut Milk Chocolate. Olza S.A. is a Polish confectionery company located in Cieszyn, Poland. Founded in 1920 by Marek Pipes, it became popular mostly on behalf of its Prince Polo chocolate wafers. The Prince Polo bar has proven time and again to stand as Poland's top-selling chocolate bar, as well as one of the top-grossing bars in various other countries. The chocolate-covered wafer, consisting of four layers of wafer paired with three layers of chocolate-flavored filling, has been joined by several new varieties, such as the Hazelnut, Milk Chocolate, and larger XXL versions.